I started sewing around the same time I met my husband. Now it's 7+ years later and the only thing I've made for him is elastic waist pajama/lounge pants. You know, that Simplicity pattern that includes both boys & mens sizes. I figure I owe him a little more than that, given the considerable number of hours I've ignored him in favor of my sewing machine. BWOF 3-2009-131 looked like a promising start. I've sewn several button-front shirts for myself, so that part isn't foreign territory, but fitting someone other than myself sure is. The front is pretty good, there is maybe a bit of extra fabric in the chest. The sleeves are a little big, I don't think those bodice wrinkles are important. Oh, and do you notice how the right shoulder is a little lower in the left? This is the first time I ever noticed this. For some reason, it just cracked me up. Not because it is truly funny, but more like it was hitting me that there were more fitting 'challenges' than I was bargaining for. This is totally normal; in fact, David Page Coffin devotes nearly a full page of Shirtmaking to a discussion of whether or not to adjust for asymmetrical shoulders in your pattern. The back is too big, in that the shoulders are too wide and there is too much fabric in the upper back. I need to fix this by pinning out the excess, or perhaps I'll just trace the back bodice of the G-Star shirt. *Sigh* And I was hoping for a "straight out of the envelope" experience. Maybe I just should have traced the RTW shirt to begin with. 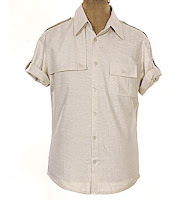 More on men's shirts to come. Well, hello, Tim! Nice to see you again. Sort of see you, that is. Looks good so far. You're nice to make him a shirt. It's been a while since I've made anything for my dh. It looks good so far, any adjustments have to be easier than for curvy femailes. I made my husband a shirt for his 40th birthday, he will probably have to wait till he's 50 before he gets another one! Its worth doing, honest! I made my husband a shirt for christmas by copying one of his favourites so he wouldnt know and he was delighted. What amazes me more is how he tells everyone that it was made for him. I guess it gets us off the hook for cuddling up to our sewing machines to keep them sweet. Good luck with the fittings. Hee hee. I'm wondering if you find yourself less motivated to work out the kinks. And, it might be interesting to see a photo in his RTW. Good luck. You know how much I like the trench look! And, what did Tim say when you said, 'I'm going to make you a shirt?" I'm so glad to see you tackle this! My DH is somewhat skeptical about wearing "homemade" clothes, so I know if I ever decide to take the plunge it had better be perfect. Tim's looks like it is well on the way to being just that! LOL... I've made those pajama bottoms for my hubby as well:) Good luck with the shirt. You're not off to a bad start. Oh, those lovely "straight out of the envelope" experiences. So few and far between, right? Good luck with this shirt. I might make my son a shirt one of these days, but then again, probably not. Good for you for tackling Tim's shirt! I would take the well fitting RTW and compare it with your pieces...trace it out to figure out what are the lines that make it fit so well. Another thing is save one of his well fitting shirts when it is ready for the rag bag and rip it apart for a master pattern...then you'll have a ready made sloper to build on! I've made countless men's shirts and once you get the hang of it they are so much easier to fit than women's clothes. Although I stick with mostly American pattersn. I was tempted by this Burda pattern. 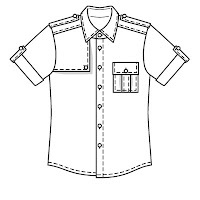 Have you seen David Page Coffin's videos on copying a shirt pattern from an existing shirt? Maybe if you did that and then laid those pieces on your Burda pattern you'd have a shortcut toward more perfect fit. I almost made this for my husband too. I still might. I have no idea what size he would be. I showed him the picture and he said, "Back darts? Aren't darts for women?" Whatever, Honey. Little Hunting Creek - no, I haven't seen DPC's video on copying a shirt, but he describes a method for doing so in the Shirtmaking book, I wonder if it's the same thing (where you layer a towel, tracing paper, and the shirt together and use a pin through the shirt to mark the stitching lines onto the tracing paper?). That doesn't sound too difficult, I may go down that road. Dawn - You know, in Shirtmaking, DPC rants about back darts in men's shirts, saying they are a sign of poor shaping at the side seams, or something like that. Well, most of Tim's casual button-up shirts have back darts(!) so I imagine DPC is referring to nicer dress shirts? All I know is, I'm putting back darts in my DH's shirt. The sleeves look large but maybe it's just because of the fabric? The fabric looks a lot stiffer than what you would use for the look. It is nice of you to make him this shirt, you'll be glowing when he tells everyone he meets how proud he is of it. That's gonna look great when it's done. It'll all be worth it in the end! Awww, you even got Mr. Assorted Notions to model for you! I'm impressed. I'm laughing though because I went through the same thing making Jeff's first shirt. I tried to modify the pattern based on measurements from one of his well-fitting ones, and after 1 mediocre muslin a lot of time I just scrapped it and copied the RTW. I've been wanting to try Adriana's press n seal method, maybe try that? I love the details on the shirt, once you get a well-fitting shirt body you can do whatever you want with it. Good luck! Looking good so far - remember to have fun with it! I go in cycles with my men's sewing - I find it a lot more frustrating because (a) I'm not that practised and (b) if it's for someone else I pressure myself a lot more to make it "perfect". Then after all that, DH wrecks it the first time he wears it (I swear the man is 5 years old...). On the other side, he does glow and tell everyone I made it. Even a whole auditorium filled with people wearing what he termed a "bowling shirt" that I made with leftovers from other projects (blue shirt, pale yellow button band, collar, and pocket - yikes!!). I keep hoping he'll wreck that one, it's not one I want advertised! Hi Christina.....I am a ShirtMaker by profession. Feel free to contact me of you run into any big problems. If I could give one little tip (n fact I should write a blog post about it :) It is absolutely essential that the fronts be cut exactly on grain. In my studio, I have trained my cutters tear the fabric lengthwise to assure that the fronts are precisely on-grain. Oooh, I'm really looking forward to making my bf clothes! He needs a little......style help. I'll be keeping tabs on your progression with this pattern. If you can find it (cause I think it's out of print, which was a retarded decision someone made) Simplicity 9469 is actually a really good one. It has shirts and pants. I've made the shirts for at least (now ex) bf's in the past, all with quite different body types and needed to make only the slightest adjustments for each. I haven't tried the pants yet, but the shirts have that really nice european close-ish fit. Men's shirts are also super quick after the first one. I can make one of the Simplicity ones easily in an afternoon - including cutting and doing the button plackets on the sleeves! *sigh* Shirtmaking is SUCH an amazing book! It completely made me realise how every shirt I'd sewn before it was pure crap! It truly is indispensable for sewing button downs... stick with it, though - you'll get there in the end, and you'll have a very happy man. I feel the same way towards my boyfriend... I spend too much time on the sewing machine and all I've made for him was a pair of linen pants. This year I want to make him a shirt too. The shirt looks really nice! I love floral shirts however i could never make one!